These people are corporate through and through. Our mom is there now and she complains about Sunshine Villa always being short-handed with caregivers. They don't train the new caregivers enough because they have a high turnover and the new people don't know what the old caregivers used to do. This leaves my mom having to tell new people over and over how she has to have things done. Sunshine Villa will nickel and dime you to death. They raise their rates yearly and then they have this point system that they are constantly adding to the points so that they get even more money out of you monthly. The food is not good. For the amount of money my mom is paying you should be eating like you are out at a fancy restaurant and not at a school cafeteria. I never see any fresh fruit or vegetables -everything is canned. When you have a problem the staff just sugar coats their answers. They never give you any real reasons just excuses. We are looking for alternatives now for my mom and will move her as soon as we find a more suitable care facility. Old world charm in a 150 yr. old mansion expanded seamlessly to include dining room, activity room, library/visiting room and garden area with gazebo. Facility is located on top of Beach hill blocks from the Boardwalk and has expansive views of Monterey Bay, UCSC hills, and downtown Santa Cruz. Rooms are cozy and equipped with emergency call pulls in sleeping and bathing areas. Staff is pleasant and greet residents by name in hallways. Activities are plentiful and varied including the local animal shelter bringing quiet dogs for an hour of companionship weekly. The best way to get to know a community is by scheduling a tour. See the facilities, meet the staff and residents, and get a feel first hand what it's like to live at Sunshine Villa Assisted Living. 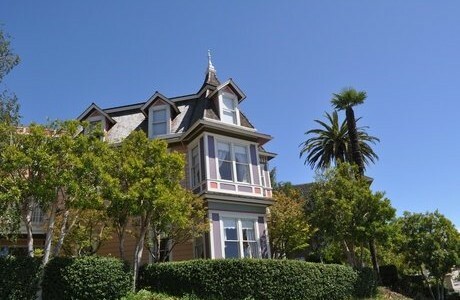 A beautiful converted and updated Victorian mansion that sits just blocks away from the Municipal Wharf and the Pacific Ocean, Sunshine Villa offers a range of supportive services and inviting accommodations for seniors in need of assisted living or memory care. There are numerous restaurants and shops close by, as well as world-class medical services at area hospitals and clinics. Sunshine Villa is owned by Blue Harbor Senior Living. An operator of senior communities based out of Portland, Oregon, Blue Harbor Senior Living has communities in six states. Throughout our community remain the elegant details of Victorian architecture and stunning woodwork. Our private garden courtyard is ideal for taking a stroll while enjoying the manicured landscaping and the trickling fountain. We plan a number of activities each and every day, and residents are encouraged to stay active. Events like exercise classes, live music, dancing, arts and crafts, and even off-site excursions are great ways for residents to keep engaged in both body and mind. Apartments here at Sunshine Villa are offered in both studio and one-bedroom layouts. All accommodations come standard with plenty of closet space, private bathrooms and an emergency call system that is monitored around the clock. Daily meals are enjoyed in our restaurant-style dining room where residents select their dish from a variety of tasty options. To help ensure that time spent at our community is as hassle-free as possible, all accommodations are provided with weekly laundry and housekeeping services. As an added benefit, all utilities, save telephone service, are included in the monthly rental cost. As a provider of assisted living and memory care, residents of Sunshine Villa have access to a range of supportive services 24 hours a day. These can include help with dressing, mobility, medication management and other activities of daily living. Here at Sunshine Villa, we offer an elegant setting and ideal location for retirement living.